For over a century, Winter Carnival has been an annual feature of many New England schools and colleges. KUA’s first carnival followed a few years after Dartmouth College introduced the weekend to its community. 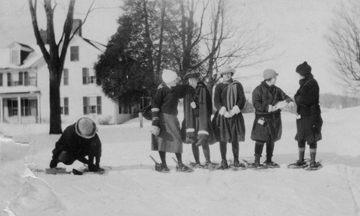 In 1910, Dartmouth’s Outing Club organized a field day with skiing as the main focus. The following year they included social activities, invited women to attend and called it Winter Carnival. KUA’s first Winter Carnival was also begun by its Outing Club, but with one big advantage over Dartmouth. KUA was a coed school and all students had the opportunity to be involved in all aspects of the activities. In the 1920s, in addition to skiing, Winter Carnival events included sleigh rides, a tug-of-war, snowshoeing, tobogganing and other events. 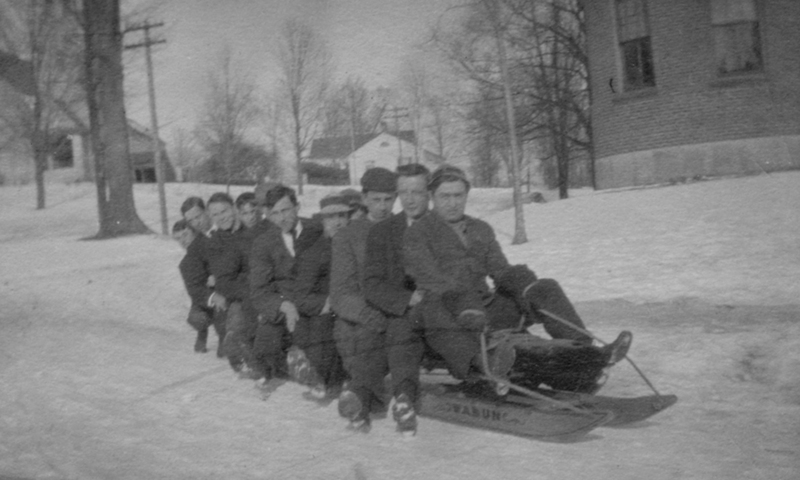 Although sledding from The Hilltop has always been discouraged, it looks as though the group of boys pictured above had at least one thrilling ride down the hill before the town authorities contacted Headmaster Tracy to protest – as once reported in an issue of The Kimball Union. The young women pictured at right prepared for their snowshoeing expedition near the same place as the tobogganers. I imagine there was little danger from cars on a snowy Hilltop in the 1920s! 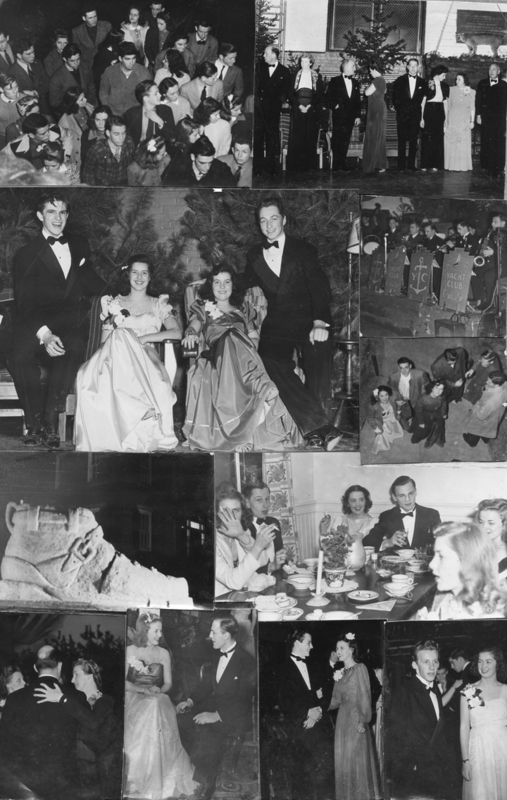 Because KUA was an all-boys’ school from 1935-1974, boys were allowed to invite their girl friends from home as guests for the annual Winter Carnival. They would vacate one of the dorms and the visitors would take over their rooms for the weekend. In 1941, The Kimball Union reported that, “The arrival of the lady guests at Meriden created the usual ardent comparison indulged in by all those who witnessed the event. The windows of downstairs D.R. were fairly crammed with spectators, as the arrivals made their way to the upper stories and their rooms.” The formal dance was held in the Silver gym followed by refreshments in the old D.R. dining hall. Snow sculpture competitions were held between dorms. The winning sculpture in 1941 is pictured above. The newspaper stated, “This ski boot, about 10 feet high and 12 feet long, built by the members of Chellis Hall, was so well done … it easily captured the statuary cup …. It is built of snow packed around a framework of wood and chicken wire.” Notice the line of faculty chaperones in the upper right hand corner and behind them on the fireplace mantle, the school mascot. Archival ski footage, ca. 1940, including some Winter Carnival scenes. 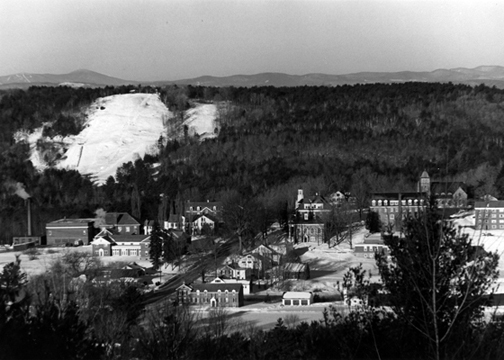 The Ira P. Townsend ’38 Ski Hill opened in the early 1960s. When the first snowflakes of winter begin to fall, sounds of good cheer can be heard across campus. The early flakes soon melt and disappear on ground not yet frozen, but they bring warm thoughts of the changing seasons and the eagerly anticipated winter fun. It has always been this way, as our archival collection of photographs confirms. Shown below are some of our earliest winter photographs found among our collection of over 160 glass slides of KUA taken at the end of the 19th and beginning of the 20th centuries. Some of the slides were taken from buildings that were privately owned at the time, such as the one of seven cross country skiers heading out on Duncan Lane, a forgotten farm track that leads from the Annie Duncan House to land above what is now Baynes Drive. The Duncan Family also gave students permission to ski and toboggan on Duncan Hill just below their house. Another slide shows five students with their snowshoes in hand standing in front of the first Dexter Richards Hall. Daniel and Hannah Kimball’s house, now the parsonage of the Congregational Church, and the old Bryant Block, originally a store built in 1812 by Daniel Kimball and his partner John Bryant, are behind them. KUA bought the store in 1858 and converted it into a dormitory. In 1910 it was deeded back to Bryant’s son, John Duncan Bryant, class of 1845, inheritor of the Kimball home; the same year, the current Bryant Hall, a gift from J.D. Bryant, was dedicated. Sadly, the original Bryant Block burned to the ground in 1927. From the top: Cross country skiers on Duncan Lane. Building a jump on Duncan Hill below the house. Girls on the Hilltop with snowshoes. Bryant Hall, dedicated in 1910 stands to the left of Baxter Hall, shown before its 1921 renovations. From the top: Skiing at KUA. Students on their way to class. Skating on Chellis Pond. Getting ready for a winter hike. Enduring e’en as Father Time. Fields of snow celestial white. To the mountain’s lofty height. Spreads a robe of whiteness there. Like weird music in the night. O’er the hilltops far and wide. More beauteous far than e’er before. In December of 1935, The Kimball Union, featured this full page picture of Santa Claus drawn by the Assistant Editor and Art Editor Earle Sanborn, class of 1937, with his wish to everyone for a Merry Christmas. Today, at this time of year, we celebrate and acknowledge together all religions and beliefs, whether at the shared Holiday Dinner, the Tree Lighting Ceremony that includes a visit from Santa Claus for students and young children to enjoy, or the annual Hannukah and Candlelighting Services, both held in the Congregational Church for everyone just before the winter holidays begin. This is a time for students, faculty and staff to share their thoughts and beliefs with each other and to wish all an enjoyable holiday and a good and peaceful new year.